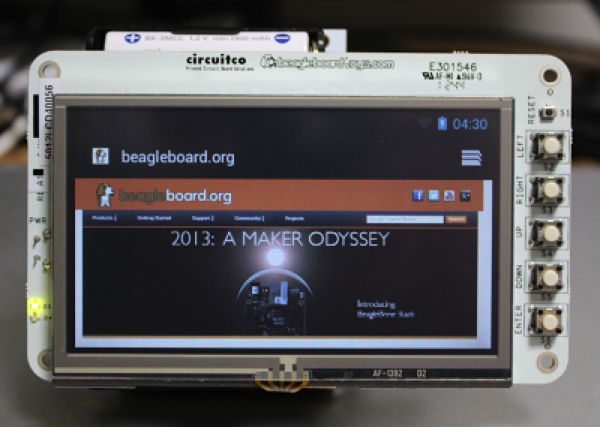 Building a wireless Android device using BeagleBone Black #beagleboneblack @TXInstruments @beagleboneorg « Adafruit Industries – Makers, hackers, artists, designers and engineers! Nikolay Elenkov wrote up this great tutorial on how to build a wireless Android device using a BeagleBone Black. The BBB is fully capable of running Android and by adding off-the shelf peripherals you can easily turn it into a ‘tablet’ (of sorts) by adding a touch screen and wireless connectivity. While the required software is mostly available in the rowboat project, if you want to have the best hardware support you need to use BBB’s native 3.8 kernel and configure Android to use it. Making hardware fully available to the Android OS is mostly a matter of configuring the relevant HAL bits properly, but that is not always straightforward, even with board vendor provided documentation. The reason for this is that Android subsystems are not particularly cohesive — you need to modify multiple, sometimes seemingly unrelated, files at different locations to get a single subsystem working. This is, of course, not specific to Android and is the price to pay for building a system by integrating originally unrelated OSS projects. On the positive side, most components can be replaced and the required changes can usually be confined to the (sometimes loosely defined) Hardware Abstraction Layer (HAL).